Entry deadline EXTENDED! TO Friday, January 26, 2018. 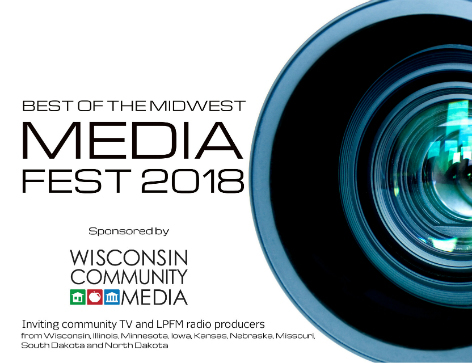 The Best of the Midwest Media Fest is THE fest to enter if you’re working at the community level through PEG access media centers or LPFM stations. Entries are judged on either a professional or amateur level. Programs win awards based on points earned. Community media managers may also recognize a Significant Community Program that has had a significant impact on your community. These programs are not judged – simply honored at our banquet and show. All award-winning producers will be celebrated at our banquet and show on May 10 at the Best Western Premier Waterfront Hotel & Convention Center in Oshkosh. The banquet is part of a two-day conference (May 10 & 11) sponsored by WCM and the Midwest Region of the Alliance for Community Media. Contact the Fest! More information about the conference and the fest is online at www.wisconsincommunitymedia.com or you can email [email protected] or call 608-215-5594. To recognize the outstanding video and radio programs that are produced by Midwestern professionals and amateurs who use PEG access television or low-power FM stations to produce and/or distribute their programming. The Fest also seeks to encourage excellence in community programming by providing constructive feedback on each program entered. Wisconsin Community Media has hosted an annual video fest to recognize the best in community programming since 1997. In 2013, WCM broadened the Fest to include all public, education, and government (PEG) access producers working in the Alliance for Community Media Midwest Region. In 2016, we expanded once again to include all low-power FM producers in the same nine states. Four-person judging panels at a dozen or more community media centers evaluate the entries. Two community access television staff and two media professionals, who work outside the access television field, judge the professional entries. Two access television staff and two community access producers with several years of experience judge the amateur entries. LPFM radio entries are judged by two access television staff whose centers operate LPFM radio stations and two judges drawn from the professional radio field. Last year, our judging panels reviewed nearly 200 entries. Video programming must have premiered on a Wisconsin, Illinois, Iowa, Minnesota, North Dakota, South Dakota, Missouri, Nebraska or Kansas PEG (public, education, or government) access channel or website between January 1, 2017 and December 31, 2017 and have been produced and/or distributed with the resources of the PEG center. LPFM radio programs must have debuted on an LPFM radio station during the year in one of these Midwestern states. The LPFM radio station does NOT need to be associated with a PEG access center to enter. Amateur: The program is mostly created by and mostly reflects the work of individuals who have never earned more than $3,000 per year from video production. Amateurs may elect to be judged as professionals. Professional: The program is mostly created by and mostly reflects the work of individuals who currently earn or have in the past earned more than $3,000 per year in the video field. If you have any doubts about the entry level to enter, you can contact the fest. LPFM: WCM makes no distinction at this time between amateur and professional entries in the LPFM category. The Media Fest Banquet and Show featuring the top scoring entries will be held on Thursday evening May 10 at the Best Western Premier Waterfront Hotel and Convention Center. The address is 1 North Main Street Oshkosh, WI 54901. The Banquet & Show is part of an annual two-day conference typically sponsored jointly by Wisconsin Community Media and the Midwest Region of the Alliance for Community Media. The Exhibitors Reception begins at 5:00 pm and the Banquet and Show follows at 6:30 pm. Tickets to the Exhibits, Exhibitors Reception, Banquet and Show are $45 and can be purchased online. During the show, Significant Community Program producers, Excellence Award winners, and Best in Show recipients are invited to say a few words about their programs after a clip is played. Producers receiving an Achievement Award for their shows walk across the stage to receive their award while a still of their program is displayed. Merit Award winners are recognized with a PowerPoint display during the banquet and pick up their awards at the beginning of the evening. If under unusual circumstances, you require an extension of this deadline, please contact the Fest. Please note that the Producer of the Program must take the entry form. Well-meaning station managers cannot use their usernames to fill out these forms. Fill out the online Entry Form for each program. Wisconsin producers and Individual Members of WCM (Friends, Independent Producers, and Emeriti) will use the Wisconsin Entry form. All others will use the non-Wisconsin Entry form. Video producers submit URLs and use bit.ly: The Fest is accepting any URL for viewing your program. Because URLs can get extremely long and errors sometimes creep in, the Fest is providing a link to bit.ly in the Entry Form that you will use to shorten your URL for the use of the judges. As a back-up, we are asking that you also give us your original URL. DVDs are not being accepted. LPFM producers submit an MP3 audio file: The Fest is providing a link in the Entry Form that will go to a dropbox in WCM's MediaFire account. Producers will upload their MP3 files there. Supporting documents: You can upload supporting documents into the Entry Form. If you need to mail paper copies of these documents, please send four copies to Jke Timm, Media Fest Entry Manager at Oshkosh Media, 215 Church Avenue, Oshkosh, WI 54901. Please indicate in a cover letter the program name, entry category, and producer name. Please note that a Payment Form should be filled out by whoever is paying the entry fee. Fill out the online Payment Form and pay. Total up the number of entries you have and use just ONE Payment Form to pay. If you decide to enter another show, you may fill out another payment form. WCM highly encourages producers to use just one payment form for all entries. Paying online. The online Payment Form enables you to pay online through PayPal with either a PayPal account or with a credit card. These options will appear as part of the online Payment Form. Paying by check. Fill out the online Payment Form and select pay by check. Checks should be made out to Wisconsin Community Media (WCM). If you mail support documents, you can include your check with the documents. Otherwise, please mail your check to the WCM Treasurer, Deb Brunett at Merrill Area Public Schools, 1201 N. Sales Street, Merrill, Wisconsin 54452. Invoicing. The online Payment Form will give you the option of receiving an invoice. However, payment still must be made by the payment deadline of January 30. If you believe payment may be delayed, contact the Fest. Each entry is scored on a 100% scale. Different weighting applies to professional and amateur entries, meeting coverage, and animated programs. Radio shows are scored using criteria tailored to the medium. After four judges score the program, the highest and lowest scores are discarded and the two middle scores are averaged to create the final score. See "Judging Criteria" for more information about scoring. To explain the recognition levels, we borrow from the Olympics. The equivalent of a “gold medal” is an Excellence Award. This award is bestowed on entries reaching a specific score or better, normally the top 10% - 15% of entries. An Achievement Award is the equivalent of a silver medal. Last year, 55 programs reached this level of recognition. Merit Awards honor the notable work of our “Bronze” scoring entries. Not all producers receive one of these awards, but typically three-quarters of our entries do. All producers will receive the judging sheets for their program with the numeric scores for all criteria and comments. A program may also receive a Best in Show Award if it earns the top score in a Subject Category and it scores high enough to qualify for a Merit, Achievement, or Excellence Award. All categories are open to both LPFM and video programs. All programs must have premiered either on cable television or an LPFM radio broadcast unless the Entry Category has an asterisk (*). If it has an asterisk, it may have premiered on a cable channel, a website, or an LPFM station. Series. * Your program has been produced and cablecast on a weekly or monthly basis. Any format. To enter, submit three shows. Short-Form Documentary/Feature. * Non-fiction documentary or feature short. Programs in this category must be fifteen minutes or less. Public Service Announcement. * Programs promoting a non-profit organization, government function, PEG access facility, LPFM opportunity, community event, or positive social behavior. There is a 20 point score deduction for videos exceeding 5 minutes in length. Station ID. * A one-minute or less promo promoting an access center, LPFM radio station or both. Computer-generated/Animation. * Programs, a segment of a program, or an “intro” or “outro” to a program in which original computer generated images and/or sound are presented with artistic intention. Paid Commercial/Sponsorship Spot. * 30, 60, or 90 second spot promoting sponsors, underwriters, or advertisers. Documentary/Feature. Non-fiction documentary or feature program about a person, place, event, organization, or subject; these entries are more heavily edited. How to/Instructional Programming. Programs that are instructional or demonstrate a craft, skill, or hobby. LIVE. Programs that originally aired “live” with no post-production. Entrants must submit a continuous, non-edited excerpt as originally cablecast or broadcast. This category excludes meeting coverage. See #17 for details on submitting meetings. Local Events. Programs covering local events and activities happening in the community such as parades, civic events, church services, etc. Producers should enter performing arts if the subject is music performance. Magazine Format/News. Programs with segments that include in-depth features or coverage of different topics. Performing Arts. Programs presenting/documenting a play, concert, dance or other performance. Personality. Programs that showcase or feature a singular personality and in some way succeed or fail on the strength of the person starring in the program. A disc jockey or talk show host are examples. Evidence of promoting the personality through other media (Facebook, Twitter, personal appearances) will be taken into consideration. Sports. Programs covering sporting events, athletes or sports topics. Talk Show. Studio programs with discussions and/or interviews between two or more people, designed to inform or educate. Meeting Coverage. Programs that are only comprised of meeting coverage footage. Entries in this category will not be judged on originality/creativity. 1. The program debuted in 2017. 2. The program is submitted with a letter from the media center briefly stating why this program was nominated and what kind of community impact it had such as increasing volunteerism, increasing understanding of an issue, elevating the profile of a local non-profit organization, or providing a much needed service to a segment of the community. 3. The Significant Community Program is accompanied by an entry fee. A portion of the letter may be read during the Fest Show. During the show, a representative of the center will introduce the producer and a clip of the program. The producer may choose to talk about the program. Each honoree receives a certificate. The media center may also choose to purchase a personalized plaque or statuette. Significant Community Programs may be entered separately for judging. Besides an Entry Category, you will also enter your program in one Subject Category that best applies to your program. Each top-scoring amateur and professional entry in each Subject category is awarded a “Best in Show.” Only programs receiving a Merit, Achievement, or Excellence Award will be considered for the “Best in Show” award. LPFM Program. All LPFM entries will enter this Subject Category. Client: Government. Your program has been produced by and for a municipality or county or some other government subdivision. Client: Schools. Your program has been produced by and for a school district or higher education facility. Public Access Program. Your program has been produced by a member of the community using a community media center. Produced by Seniors. Your program has been produced by seniors 62 and older. Amateurs only. Produced by Youth. Your program has been produced by youth, 18 years old or younger. Produced by College Student. Your program has been produced by a college student. Cultural/Ethnic. Your program has been produced to celebrate our differences and enhance our understanding of diverse cultural or ethnic groups within communities. The following table shows how programs are judged. Programs are given a score of 1 – 10 for each of these criteria. The chart shows how each criterion is weighted. Because we want the Fest to be an educational experience for those who enter, we are making a special effort in 2017 to encourage all judges to write constructive comments for each entry. Contact Mary Cardona, Executive Director, WCM at [email protected] or at 608-215-5594.